For almost two years new condo sales in the City of Toronto were trending downwards. A few months ago I suggested that the bottom for new high rise homes was forming as sales declines had significantly slowed. According to the latest data it looks like the pre-construction condo market in Toronto has reversed itself as units this past December were selling like it was 2011 all over again. Specifically in December, new condo sales were up by 103% in the City of Toronto. Even though condo sales were up - prices weren't. Realnet's new home price index for condos was unchanged from a year ago at $436,564. 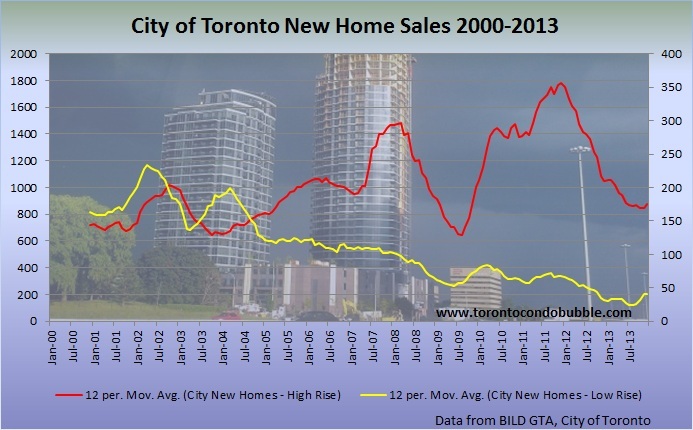 The fact of the matter is that pre-construction condos are currently trading below 2011 prices. Makes me wonder who is buying all those unbuilt condos? Why not buy a resale condo now for about the same price instead of waiting years before you can occupy a new unit? Moreover, with condo rents already falling and more condo units coming up online this year, pre-construction apartments no longer look like a good investment opportunity. The number of condo listings for rent increased by over 30% in the fourth quarter of 2013. The average condo rent for a 1 bdrm apartment declined by 1.6% this past quarter. 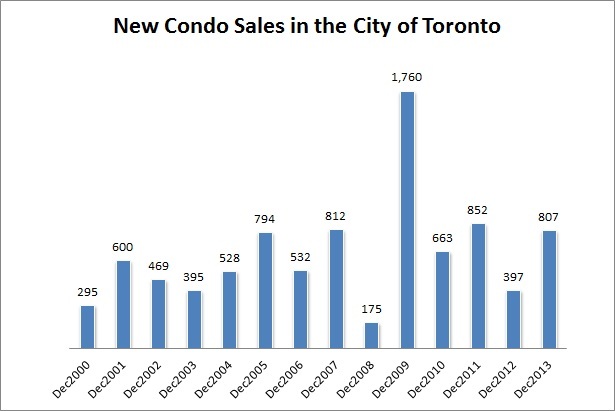 Nevertheless, resale condos in the City of Toronto were still rising in price during the first two weeks of January. Condos were up by 8% in the 416 and by 18% in the 905. Now while you might be impressed by the recent Toronto real estate stats I must warn you. The Toronto housing market is not driven by the fundamentals - it is driven by a belief that the worst of the housing slowdown is over. Look - it's not rising incomes or employment growth that is pushing the prices up - it's human perception of ever-rising prices. For instance, the median hourly wage in the GTA was unchanged this past December from a year ago at $21.15. Also recall that this past month employment actually decreased in Toronto as the unemployment rate shot up over 10%. In my opinion the worst is yet to come. When? I wouldn't be surprised if prices keep on rising for another year or even longer. Then it would take up to a decade for prices to reach bottom. 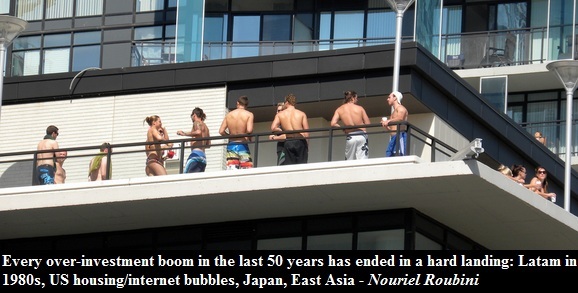 Also, in my opinion, the next real estate bust will be synchronized across the world with dozens of housing bubbles bursting around the same time.